Throughout the world, the Anglo-American model of corporate governance tends to prevail – but no two countries are identical. Governance outcomes in developing and emerging economies often deviate from what theory predicts, due to a wide range of factors. 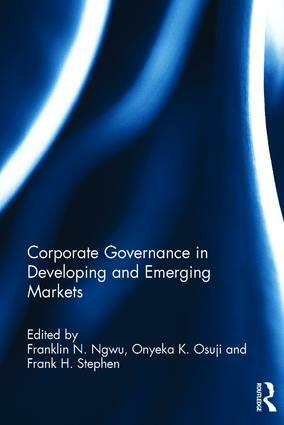 Using insights from New Institutional Economics, Corporate Governance in Developing and Emerging Markets aims to explain the different issues and cultural and legal factors at play, and put forward an alternative governance framework for these economies. Structured in three parts, this text investigates different models of corporate governance; it explores the realities of corporate governance in ten nations, including the ‘BRICS’ (Brazil, Russia, India, China and South Africa) and ‘MINT’ (Mexico, Indonesia, Nigeria and Turkey) countries; and then considers corporate governance reform. This interdisciplinary text will be a valuable tool for students of corporate governance across Business, Economics and Law; and an equally useful resource for anyone working in or carrying out research in this area. The market for corporate control and shareholder versus stakeholder models: whither developing and emerging market economies?